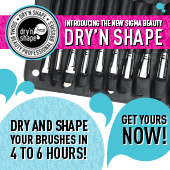 Sigma Beauty Affiliate Program: Dry'n Shape Release! As an affiliate, one of the biggest opportunities to boost your sales is the release of a new Sigma Beauty product. When the new product is a revolutionary, one of a kind drying system that is only available at Sigma Beauty, the sky is the limit! 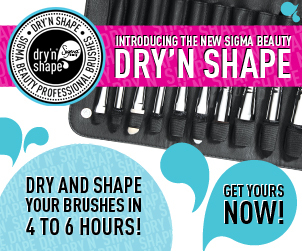 We would like to introduce you to the newest member of the Sigma Beauty family, the Dry’n Shape. It is a quick and effective way to dry and shape your makeup brushes. No more hassle and no more waiting! The special fabric applies pressure to the bristles and allows for water evaporation. Not only will your brushes be completely dry after 4 to 6 hours, but they will reshape to their original form. This amazing new product is only available at Sigma Beauty! To celebrate the release of this innovative design, we’ve created new affiliate banners! You can place the banners on your blog and upload a post describing the product. The Dry’n Shape will change the way we wash makeup brushes from now on, so make a big splash with your blog post! Just copy your favorite banner below, paste it on your blog, and add your affiliate link! All affiliates in April’s DIAMOND, PLATINUM and GOLD rewards categories will receive a complimentary Dry’n Shape! We will also pick a lucky affiliate from each of the SILVER and BRONZE categories to receive the Dry’n Shape. Utilize this product release to your advantage and market the new product to your clients! Wowwwww its awesome . But how you will choose 1 from silver and bronze categories to receive the Dry'n Shape ? posted on my blog about it! @Sunshine_me009 We picked one affiliate from each of the Silver and Bronze categories at random! @luciana You can upload a post talking about the new Dry'n Shape and include your affiliate link! Love it! I just posted on my blog! I love it! But when the banners will be released in Portuguese? @Luana Araujo Yes! We will have Dry'n Shape banners in Portuguese. You can contact amy@sigmabeauty.com for one! Good night! My name is Luciana Barbosa! SIGMA I represent in my blog. I made the request for a brush that you would be sending to reprensentante, a top flap, but did not ... a friend asked after me and hers has arrived! Who can I talk about? tienen esta imagen, en español? This looks really awesome!!! I always have problems with my brushes loosing their shape.. I will have to get this soon! awesome, i just become gold affiliate today. Can i ask, when can i received this Dry n shape system, and the gift certificate? @NataChannel Please contact amy@sigmabeauty.com for the Dry'n Shape banners in a different language. @raven49 The Dry'n Shapes where sent out to the Platinum, Diamond and Gold Affiliates for the month of April. Participate in on going contest and get a chance to win Sigma Flat Top Kabuki F-80 Brush . Open internationally. 15 days Left to end the Contest . Odio esperar a que se sequen las brochas, qué gran idea! Amei esse lançamento e vou amar mais ainda se for a escolhida para ganhar um, rs. Já lancei o post, associei ao sorteio que estou realizando junto a parceria de vocês. Depois de uma olhada lá! Adoreii..Mas não tem em portugues?! Se sim como proceder.? I would like to have this banner 170X170 in portuguese. Is it possible? @Vanessa Please contact amy@sigmabeauty.com for the Dry'n Shape banners in a different language. @Evili For a Dry'n Shape banner in a different language contact amy@sigmabeauty.com. que mas tengo que hacer???? @luciana Please contact affilaite@sigmabeauty.com for any affiliate questions or information. Thank you! Hi everyone! I was able to get a banner on my blog from my account, but I'm unsure how to post one of these correctly. HELP!? @Kim Baker We have a great video that you can watch that will help guide you through the process of posting a banner. Please visit http://www.sigmabeauty.com/Affiliate_info.asp. For any additional questions you can contact affiliate@sigmabeauty.com. I'm not able to copy and paste them into my blog. There is supposed to be a code for me to copy and paste, right? I don't see any codes. Why aren't these new banners displayed with the old ones with the codes? I have the same exact question as Kim Baker. Sigma Beauty, that video was not helpful. It told us how to get a banner from the ones under our accounts, but not THESE new banners because they do NOT have codes to them. Copy and pasting will not work. Is there any way you can provide codes for these new ones like you did with the old ones?? @Huda Kaake Sorry that the video was not helpful. Here are a couple different options that may work. 1)Click on the banner, this will open an individual page for the banner. Then try to copy and paste it to your blog. OR 2)Click on the banner, opening an individual page and then right click on the banner and "save picture as" to your computer, then insert the banner onto your blog. If you have any trouble you may also contact affiliate@sigmabeauty.com. Quem ganhou o prêmio de afiliado elegante do mês de maio? @luzi We did not choose a Classy Affiliate for the month of May. Please keep a look out for the next Classy Affiliate! Sigma Cleansing and Polishing Tool Release!